Cameras, branding, lighting and timers all at the touch of a button. 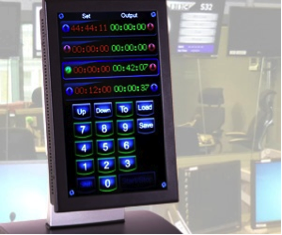 Accurate clocks, timing and cue information are essential components of any broadcasting environment directors, production teams and presenters have always depended on them for the delivery of broadcast critical operations. This is still the case today and very unlikely to change. What is changing though is the way that broadcasting organisations are creating and delivering their content. Budgets are tighter, competition is rife, delivery channels more numerous and technologies more diverse. One of the outcomes of all this is that facilities are now designed to be multi-functional, catering for the needs of many different users. 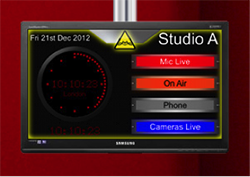 It is now very common for studios and control rooms to be used by different stations and their production teams, reducing operational costs in the process. Dealing with the complexities of these new facilities means that we all have to work and think much smarter and as a consequence, Chief Engineers and Specifiers are looking more and more for total solutions that can be operated by non-technical staff, expanded as requirements dictate and represent good value for money. Systems Integrators (SIs) have always worked hard to keep abreast of change and deliver solutions that are fit for purpose. Nowadays, it is unlikely that youll come across a hard-wired studio with all its cumbersome equipment. And there is a very good reason for that making changes to these old fashioned systems was invasive and expensive. Today, you are much more likely to find conventional IT practices being deployed, in particular IP networking and with good reason. The advantages of IP networking are significant; its scalable, so it is easy to expand; its convenient, making it easy to install and it is future-proof, meaning that it is very likely to fit with any future requirements. Exploiting these qualities has helped IPE a UK-based SI with over 30 years experience design and develop their own sophisticated solution especially for the broadcast industry. Designed with production teams in mind but with much wider applications, IDS is an IP-based display and control system that delivers bespoke information and control interfaces to users via networked display devices. Take clocks, timing and cue information for example. Traditionally, these functions would have required extensive wiring and sophisticated logic to perform even the simplest operation. Today, all of that functionality and sophisticated logic can be delivered and controlled using modern off-the-shelf display devices connected over their own IP network. Gone are the ugly consoles and inaccessible wiring. Dynamic information based on custom layouts and designs can be delivered to any connected display device. Information can include clocks, cue lamps, scrolling text, control interfaces, video streams, URLs, RSS feeds, alerts, signage and branded media. Import XML files, input data via keyboards or interface with third party control and automation systems. 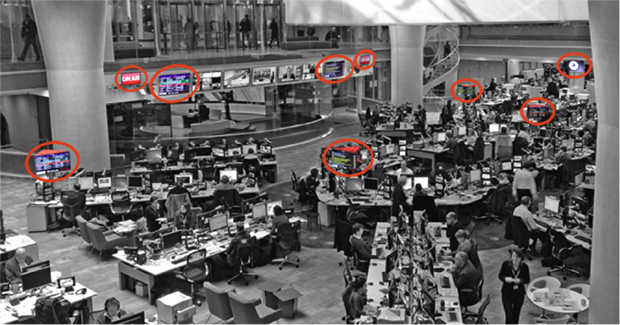 Whatever the source, the information derived is then displayed exactly where it is required; studios, control rooms, newsrooms and open areas. In fact, IDS appears very day on the BBCs flagship news programs as the image below shows. IDS doesnt just interface with essential broadcast equipment, it also integrates with a growing number of third party control, automation and playout systems. It can control cameras, mixers, DMX lighting and many other common devices. Furthermore, its powerful software enables users to create their own pre-set configurations making it ideal for multi-use facilities. For example, using intuitive touchscreen controls, users can dynamically change a variety of displayed content not just clocks and cues but branding and other user specific information. They can also control lighting for live environments, pedestal heights, cameras, messages and alerts. display and camera in the background. We live in a crowded, connected world. Competition (and advances in technology) has meant that broadcasting is now much more of an interactive experience with radio in particular becoming more visual. Dealing with this demand has generated a plethora of rich content, including live video feeds, URLs and much, much more. All of this content can be delivered over IDS to displays situated within studios and live areas meaning that consumers can feel more involved and organisations can get their branding messages out there. All these functions are common to radio and TV broadcast facilities meaning that IDS really is a tool for the future. Networks can be very simple with only one or two devices or consist of hundreds of devices, operating either as a whole or broken down into specific groups for particular locations. Sharing facilities doesnt have to be a headache as the modular and expandable nature of IDS means that it is particularly advantageous when building a large system. Devices can be grouped together to perform specific functions and with familiar touch screen behavior and intuitive user interfaces operators can quickly get down to what they do best. Furthermore, changes to configuration and workflow can be made on-the-fly and with little training. We are constantly developing, working with the requests of users so that it meets their growing expectations. The latest software supports WAN, enabling one of our US customers to control production timers in their New York facilities from their studios in LA and vice-versa. Another of our customers, based in the Netherlands is using the newly developed Ember interface to control Studer audio consoles. Were often told that IDS has opened up possibilities where previously they didnt exist, and the reason for this? Well, we think IDS fills a need that exists in every broadcast organisation. Its easy to install, easy to expand and easy to use. Everything an IP based solution should be. 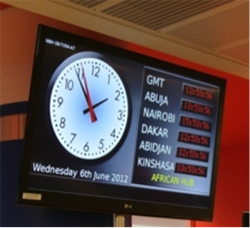 On Air warnings, clocks and arrivals boards all via IP.